What if you could brighten your day with the push of a button? And if that shine came from your clothes? Your hat? Or even your glasses? From Google Glass and Recon’s heads-up display to FitBit and the Apple Watch, technology that you wear is no longer a thing of science fiction. There’s so much wearable technology out there, “why not use it to treat something?” asks Halley Profita, a PhD. student in the Correll Robotics and the Kane Superhuman Computing labs in the Computer Science department at the University of Colorado Boulder. Could she use wearable tech to help people feeling the drag of winter blues? 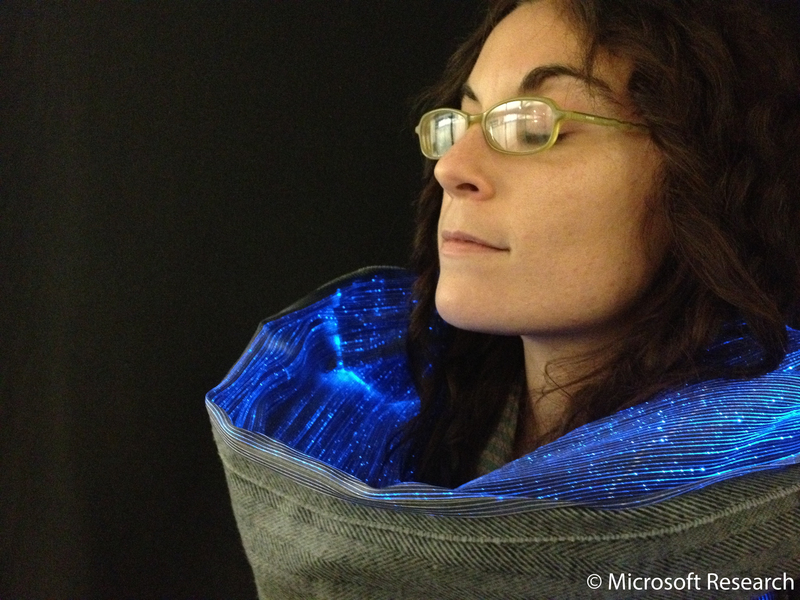 In collaboration with Microsoft scientists Asta Roseway and Mary Czerwinski during a summer internship, Halley designed several lines of light-emitting wearables using LEDs and fiber optics sewn into clothing. 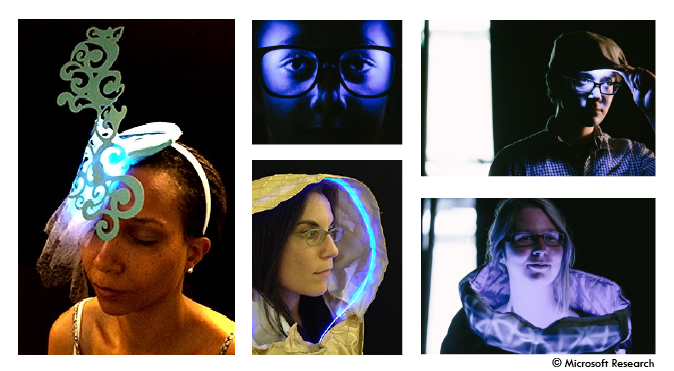 Her garments, known as Lightwear, are luminous (literally), fashion-conscious clothing that anyone affected by winter depression can use to brighten away those blue funk doldrums. The onset of winter means fewer hours of sunlight, particularly at higher latitudes. For many people, the shortage of sunlight lowers their energy. Grogginess, irritability and general listlessness are traits that characterize a mood disorder – seasonal affective disorder, also known by its fitting acronym, SAD. Getting more sunlight is the typical treatment for SAD. Jet setting to a sunny locale for the duration of the winter months would be great, but unfortunately isn’t a feasible option for most. Instead, people experiencing SAD often use a full spectrum light box. These light boxes are over-sized lamps that shine the full spectrum of visible light in all its blinding brilliance. The artificial sunlight tricks the brain into thinking it’s getting more sunlight. However, there are a few problems with this standard of care. Imagine dragging yourself out of your warm, cozy bed, bracing yourself against the cold air, groggily fumbling through the dark to position yourself in a fixed posture with extremely bright lights shining at your eyes. Then convince yourself to remain in that position for 30 minutes to a full hour. Now, imagine you hit the snooze button one too many times. You’re running late. How motivated are you to use this light box? For most people with SAD, clinically diagnosed or not, the answer is: not very. Almost half of surveyed light box users admitted to not using it because it’s so inconvenient. It’s hard to get ready for work in the morning when you have to sit still in front of the light, and even harder to get up earlier than you would otherwise have to just to use the light box. “There’s a huge non-compliance rate, so in the end, one has to think, ‘What’s the point,’” Halley observes. Current research indicates that blue light works best for people affected by SAD. This is great news for people with SAD because the blue light boxes are only 2-4% as bright as their full spectrum counterparts. “We thought since blue light is effective at a lower intensity, can we put it on people so that the light therapy moves with them?” asked Halley. In her designs, Halley only used lights that emit at this end of the spectrum. Because the blue light is not as bright, users aren’t blinded as they usually are with full-spectrum light therapy. She wanted to allow users to move around, get ready for work, and go about their day without being encumbered by the inconvenience of sitting still for an hour in front of a blinding light. Through an online survey, Halley discovered that people with SAD were open to wearable therapy, like scarves and hats with blue light LEDs or fiber optics sewn into them. Halley emphasized making her garments fashionable as well as therapeutic. For example, the light from the wearables must strike the retina at a certain angle to deliver beneficial effects, but couldn’t be too close as to interfere with users’ vision. Many users thought so, with one participant commenting that she liked the fact that her need for light treatment gave her an ‘excuse to wear a fashion-forward item that she typically wouldn’t wear otherwise’. Lightwear can encourage people struggling with SAD to embrace rather than shun their illness. Based on Halley’s work, the clothes are cool and people with SAD enjoy the fact that their therapy moves with them. Plus, Lightwear enables people to feel good about themselves despite struggling with winter depression. Now the question is whether the clothes are as effective against the winter blues as conventional light boxes. Halley acknowledges that in an era of STEM research, art remains significant. Innovation requires creativity, and design is a part of that. She presented this work at the International Conference on Tangible, Embedded and Embodied Interaction (TEI) at Stanford University in January. Halley is grateful to her advisers Nikolaus Correll and Shaun Kane for their support and encouragement in pursuing research interests in wearable technology, as well as Asta Roseway and Mary Czerwinski of the VIBE research group at Microsoft for their guidance and mentorship.